The Paella Parade takes over South Street Seaport on June 7. The Event: The 1st Annual Paella Parade, which will bring together a host of Spanish chefs and restaurateurs competing to win over judges and the hungry public with their paella skills. 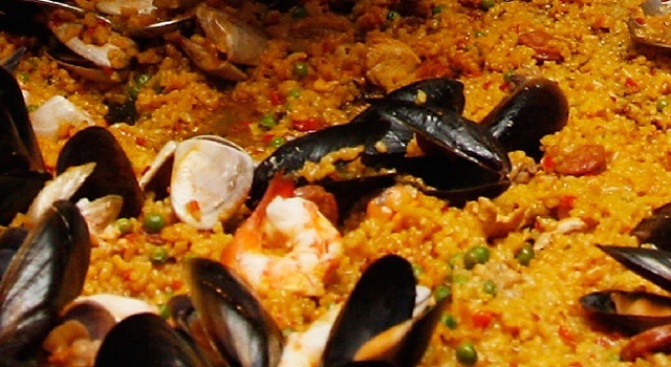 What We're Looking Forward To: Paella + rioja + water view = what's not to look forward to? There are some standouts in the chef line-up: We're excited to taste dishes made by the minds behind Mercat, La Nacional and especially Socarrat, the Chelsea joint that many Spanish transplants insist is the definitive paella to be had in NYC. The South Street Seaport's a long way from Valencia, the Spanish town that birthed paella, but liberal pours of rosé wine (the event is sponsored by El Coto de Rioja, and that's what you'll be drinking) should make you forget the discrepancies pretty quickly. And at day's end, get home by boat: The event takes place at the brand new South Street Seaport NY Water Taxi beach. Cost: $25 gets you more paella than you ever knew you wanted, plus El Coto de Rioja to wash it down.